Physical Education in school is hugely important in a child’s development physically, mentally and socially. Classes are taught 6 different strands each year. They are Games, Athletics, Dance, Gymnastics, Aquatics and Outdoor and Adventure. Teachers use the ‘Primary School Sports Initiative’ resource materials to support their lessons. These are available to all teachers on the school server and in the PE resource library. In St. Clare’s NS we aim to include a variety of different sports and activities during the year in the PE curriculum. Over the last two years during ‘Active School Week’ we have introduced the children to ‘Archery’ and ‘Tug of War’, which were really interesting and different. We emphasise the importance of keeping active during play time with initiatives such as ‘Do your talking as you’re walking’ and ‘Active Breaks’ in the class room especially on rainy days. Children receive 60 minutes of timetabled PE during the week but are often rewarded with extra PE/physical activity for good behaviour or achievements earned. We ensure that children with special needs experience the enjoyment of participation in and progression through the stages of the Physical Education Programme. In planning their PE lessons teachers take into account the individual learning needs of the children in their class. Staff members have attended Disability Inclusion and Awareness Training workshops organised at a local level through the Cavan Sports Partnership. Children with special needs receive additional, individualised PE time with their learning support teacher and/or SNA to improve mobility, co-ordination and confidence. We also make sure that in advance coaches are informed about children with special needs so they can adapt their activities accordingly. Every class has 1hr timetable PE slot per week. Free slots are shown on the timetable allowing teachers to make use of the hall for discretionary time. Discretionary curriculum time is used to promote physical activity at various stages throughout the school year e.g. School Sports Day, G.A.A. Celebrations, Active School Flag initiatives, Active School Week, Seachtain na Gaeilge, Sporting competitions etc. We have a fantastic storeroom full of PE equipment. Both the PE Monitors and the Active Flag committee regularly check the store room to make sure that everything is replaced after use and stored neatly. Everything is clearly labelled and easily accessible for use in PE lessons. Monday 11th March – 3-4pm Croke Park Hour – Defibrillator and 1st Response refresher. John Sweeney from the Cavan Ambulance service gave a one hour training session to the whole staff on how to administer CPR and how to use a Defibrillator. All staff had the opportunity to practice giving chest compressions and received step by step instructions on how to use the defibrillator. At the end of the session, staff felt reassured on what to do in the event of such an emergency and agreed that the AED/defibrillator should be taken out frequently during the school year to ensure familiarity with the machine and increase confidence in how to use it. 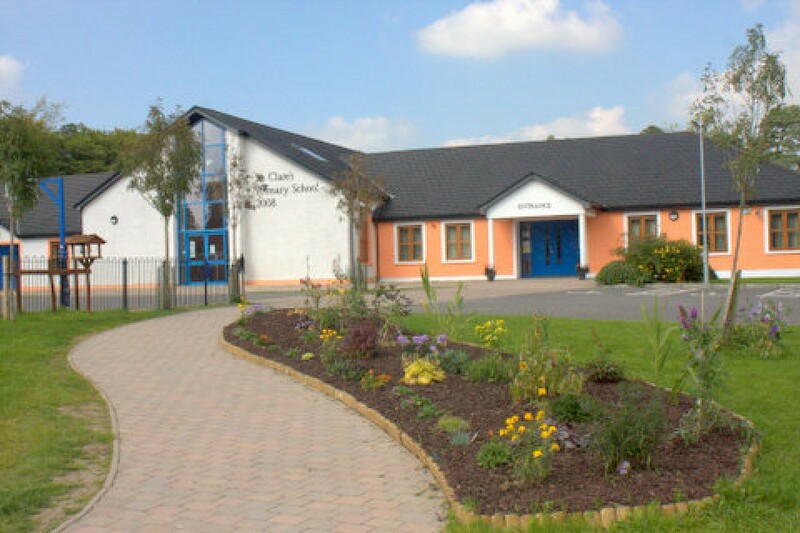 Ms Carroll and Ms Sullivan attended a Folk Dance Workshop hosted by the PDST in St. Clare’s NS Cavan Town on Wednesday the 13th of February 2019 from 2.30 – 4.20pm. The workshop explored the Dance strand of the PE Curriculum with a particular focus on Folk Dance. We explored a variety of multicultural folk dances suitable for all age groups and identified ways to embed the development of fundamental movement skills into the Dance strand using the Move Well, Move Often resource. The workshop was very enjoyable, with lots of fun and easy to implement ideas and activities for teaching ‘Folk Dance’ in school. All resource documents and playlists were shared with the whole staff via our school communication system ‘Aladdin’. We also made copies of the workshop booklet and added it to our PE resource library for teachers to use in their own lessons. Ms McDaid and Ms Sullivan attended a Gymnastics workshop on the 20th of November 2018 from 3.30 – 5.30pm. The Workshop was run by the Monaghan Education center and took place in Knocktemple N.S. Virginia, Co. Cavan. The workshop focused on rolling variations and sequences. It was a two -hour workshop which aimed to develop teachers’ confidence and competence to safely teach a wide variety of rolling techniques and progressions within gymnastics at all class levels.All resource materials were shared with staff via the school communication system ‘Aladdin’ and copies were made for the PE resource library for teachers to use in their own lessons. This course provided approaches, strategies, resources and ideas for PE lessons. It covered all areas of the P.E curriculum including lesson planning, teaching approaches and content delivery, organisation and teaching points, warm up and cool down routines, games and skills development, outdoor challenges and athletics. This course was run by the INTO in collaboration with Irish Water Safety. This course aims to increase teacher knowledge and awareness of water safety at sea, on inland waterways, on the farm, in swimming pools and at home. It explored a variety of teaching approaches and resources to support the teaching of water safety. In particular, it explored the Irish Water Safety and Primary Aquatic Water Safety Programme (PAWS). The PAWS programme is currently being implemented in classes across the school. This course was organised and run by the GAA in local education centers and was attended by Ms Murphy, Mrs Smith, Ms. McKay and Ms. McKenna. The aims of this course were to introduce teachers to Gaelic games including hurling, Gaelic football, camogie, ladies Gaelic football, handball and rounders. The main objective of the course was the advancement of teachers pedagogical, teaching, learning and management skills in the context of the primary school physical education (PE) curriculum. Ms. McKay stated that “The course was very useful in relation to the delivery of PE right throughout the school. The course enhanced my knowledge of how to integrate PE with other subjects in the curriculum while showing various methodologies where resources may be limited”. Here in St. Clare’s, we always encourage the children to live healthy and active lives. The general health and mental health benefits of activity are well documented and include better focus, stronger immunity, happier mood, improved heart health, stronger lungs etc. Scientific research shows that short periods of physical activity–even as little as 10 minutes at a time–performed throughout the day provide health benefits similar to longer periods of physical activity. Therefore we have decided to introduce some ‘Active Homework’ in all classes on the days the students have PE. We have compiled a long list of ideas that the children can choose from, some of their favourites are ‘Create an obstacle course in your house’ and ‘The Baby Shark Dance’! Please have a look below at all the fun activities we do in PE lessons! The aquatics programme is concerned with gaining competence and confidence near, under and on water. Fifth class have started our annual block of swimming lessons and are really having a splash! We travel to our local swimming pool in Cavan by bus every week to carry on from what we have learned last year and also to learn some new skills. Fourth class lessons will follow over the course of the next month so get practising! Irish Water Safety has created an educational resource for primary schools called PAWS (Primary Aquatics Water Safety). PAWS outlines life-saving guidelines for children of every age and is available digitally to every school in the country. PAWS teaches children how to be safe around water in homes, farms, pools, beaches and on our waterways, and is written and designed for different age groups. The website contains all sorts of interactive games and puzzles to reinforce lessons learned, PAWS incorporates all aspects of the Physical Education Aquatics strand of the primary school curriculum. It also integrates with the SPHE curriculum covering the strand Myself and strand unit Safety and protection. After completion of the online lessons and activities, students receive an Irish Water Safety Certificate. Congratulations to 3rd Class on receiving their Land PAWS certificates! The games strand fosters the child’s natural tendency to play through informal play activities. It enhances the development of basic skills, and many opportunities are provided for social interaction. Invasion games, net games, striking and fielding games, target games and shared court games provide a range of opportunities for the development of skills and understanding. Small sided or mini versions of these games encourage maximum participation. Mr. O’Connor started Yoga with his 3rd Class this January. They look very zen! Namaste! Gymnastics in education is concerned with the use of movement in a creative way in response to set tasks, both individually and with others. Children explore movement on the floor and when negotiating a variety of equipment. This year St. Clares prioritised Gymnastics for further development. We bought some new trampolines, scooter boards and hoppers to help develop muscle strength, balance and physical co-ordination. We also purchased some balance beams and junior ribbons and wands. The purpose of the Play Wands is to develop artistic movement in rhythmic gymnastics. All the new equipment was used at both the Junior and Senior Sports days in June. We put in place new playground trails on the Junior and Senior yards which help further develop balancing skills during playground games. The school invited Impulse Gymnastic Club to deliver extra gymnastic lessons to Junior Infants, Senior Infants and 3rd class. The instructors have set up an after school Gymnastics Club in the school hall which is running every Tuesday from 4pm to 5pm for 19 weeks. Ms McDaid and Ms Sullivan attended a ‘Teaching Gymnastics Skills in PE’ workshop hosted by the PDST in Knocktemple NS. Ideas and activities for lessons as well as PDST resource documents were shared with the whole staff during a Croke Park Hour. As a result of these PSSI lesson plans, the support and experience of Impulse Gymnastics Club, the setting up of the After School Club and teacher CPD in Gymnastics, all teachers are now more confident about the delivery of Gymnastics lessons. Little Emilia from Junior Infants dressed up as Natalia Koziot, a famous Polish gymnast during Active Week! Third class have been busy trying out some spectacular moves in gymnastics and are definitely head over heels about it!!! Junior Infants are head over heels in love with the Gymnastics class that has started in St Clare’s! What a way to tumble into the week! Dance in education involves the child in creating, performing and appreciating movement as a means of expression and communication. Dance differs from the other aspects of the physical education programme in that the primary concern is with the expressive quality of movement and the enjoyment and appreciation of the aesthetic and artistic qualities of movement. The dance programme involves the child in a range of creative and folk dance. Zumba is a dance fitness program created by a Colombian dancer and choreographer during the 1990s. Zumba involves dance and aerobic elements. The choreography incorporates hip-hop, samba, salsa, merengue and mambo. Squats and lunges are also included. Approximately 15 million people take weekly Zumba classes in over 140,000 locations across more than 185 countries!! Ms O’Growney’s class learned ‘Shoe the Donkey’ and ‘Walls of Limerick’. There was plenty of upcoming Michael Flatleys and Jean Butlers battling it out! Fifth class are always ready come ‘Seachtain na Gaeilge’ to impress Mr McCartin and the other classes with their mastered skills in the School Ceilí. Outdoor and adventure activities are facets of the physical education curriculum concerned with walking, cycling, camping and water-based activities, orienteering and outdoor challenge activities. We are so lucky in St. Clares that have a beautiful walking route around our school called ‘The Nuns Walk”. Its great for walking in any season, all classes use it during the year as part of the strand ‘Outdoor and Adventure’ and because it is so green and leafy you can really see all the different seasonal changes. Here are Ms. Carroll’s Senior Infants enjoying a nice Autumnal walk in October. The athletics strand provides a variety of opportunities to engage in the natural activities of running, jumping and throwing. In the photos below the Senior Infants are enjoying some relay races!